Library Park, that beautifully maintained, triangular park bounded by Ferry, Derry, and Library streets was a gift to the Town of Hudson by Mary Field Creutzborg and the efforts of her son-in-law Dr. Alfred Hills. There is a granite boulder with a tablet at the park near the intersection of Ferry and Derry Streets The tablet reads: LIBRARY PARK – The gift of Mary Field Creutzborg 1911. 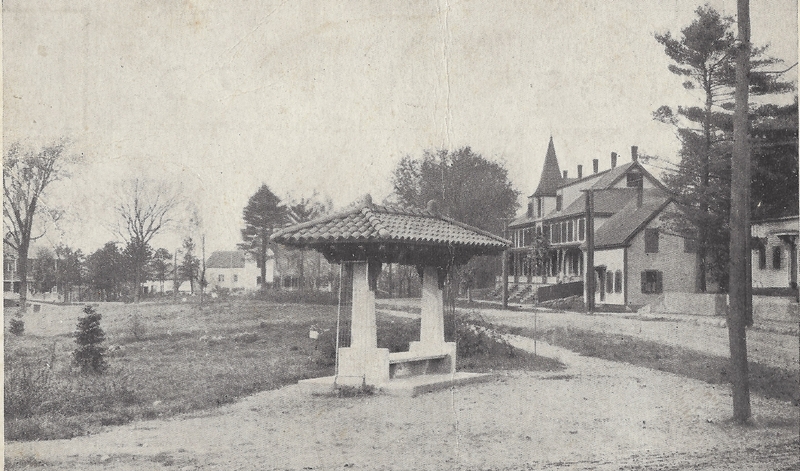 Just prior to 1911, this parcel of land was owned by parties living in Nashua. They had sub-divided it into eleven house lots and offered then for sale. Two had been sold and a house was being erected on one of them. The residents of Hudson were beginning to realize that a potential of eleven houses in that area would be of no real value. There had been earlier discussion about acquiring the land for a public park; but, no action had been taken. 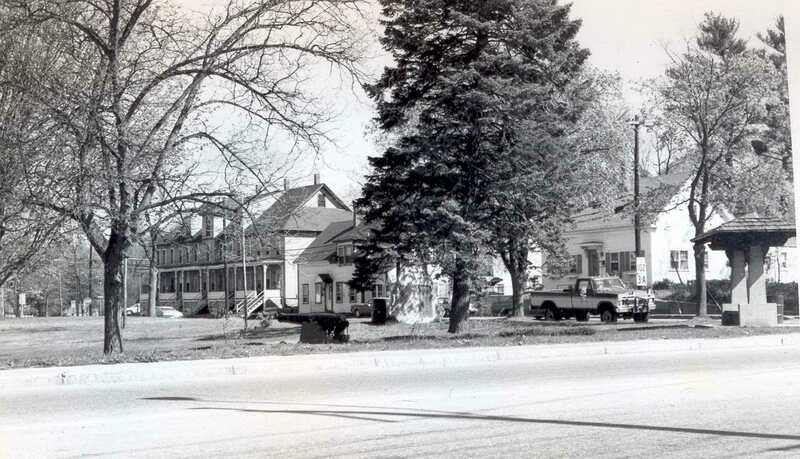 A special town meeting was called May 15, 1911 to see if the town would authorize the Selectmen to acquire this land by eminent domain for the purpose of a public park. Dr Hills offered a resolution: that the Selectmen be authorized to acquire the property for a public park, to be known as Library Park, at no expense to the town. The resolution passed unanimously. The owner of the house under construction was compensated with a much larger lot in a more desirable site. The selection of the name Library Park was deliberately chosen by the Hills/Creutzborg family. Mrs. Ida Virginia Hills had passed away and the nearby library had been presented to the town in her memory. Our first photo of Library Park was taken C 1920 from the corner of what is now Ferry and Library Street. This photo is courtesy of Gerald Winslow and a part of the Historical Society Collection. The second photo is Library Park from Ferry Street looking toward Library Street C 1976 and is also a part of our collection. Library Park is greatly appreciated by the citizens of Hudson. We are grateful to the donors for their foresight and generosity. By Ruth M Parker in Bridge Area on September 25, 2015 .